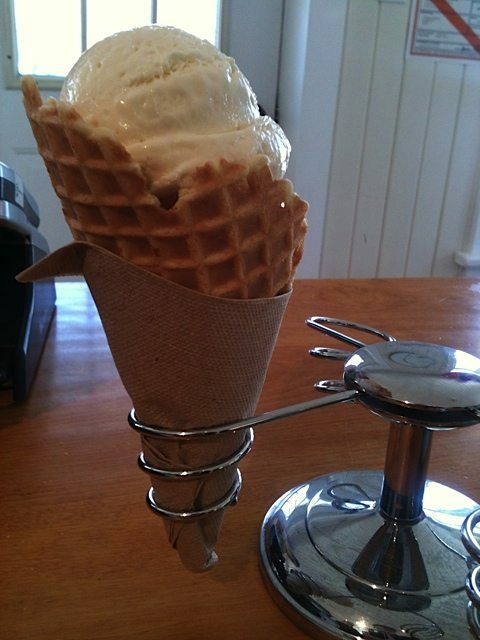 WEEKLY LUNCH PICK: Cross the river for real original thin-crust pizza and homemade ice cream. Fresh air is free. 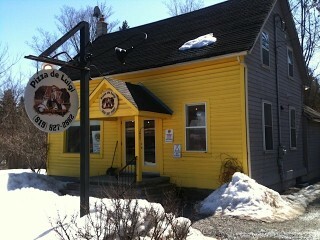 Back in 2007, the original Cheezy Luigis transformed the main street in Wakefield, Quebec into a major pizza destination. 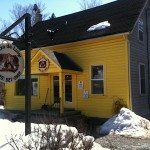 That location has since been sold and remains a pie joint renamed Pizzeria Mama Gen. However Cheezy himself (a.k.a. Luigi Meliambro, also a partner in the new Bootleg Portchetta Co.) continues to hand-toss his excellent homemade pizzas in a charming bright yellow painted house on Chelsea’s main road. It’s a perfectly pleasant 18-minute drive from the Byward Market and happens to represent an excellent afternoon excursion in the fine weather; a delicious urban diversion that offers with it a medicinal dose of fresh country air. I speak here from experience. 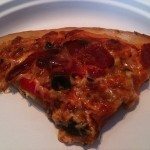 I love the charming homey ambiance of Luigi’s shop in Chelsea as well as the creative and fresh topping combinations on the pizzas — catering to preferences for thinner or thicker crusts (don’t we all prefer thinner?). I also appreciate the fact that there’s a “bambini” option so that the junior eater or afternoon snacker can have their very own wee-size pizza for 4-bucks rather than the $14 investment that other gourmet pizza places tend to charge for a one-size-only minimalist Margherita. A slice of Luigi's Secret -- the secret is out! On a recent visit, I discovered what the buzz is about when it comes to the popular Magik Mushroom and Verona pizzas that attract devotees with local organic mushrooms and lusty truffle oil. I was even more delighted by what’s called “Luigi’s Secret”: herb-flecked thin crust pizza crowned with capicollo ham (crisped from the oven’s heat), kalamata olives, hot peppers, and portabello mushrooms. Spicy, savoury, earthy and sweet, with great crisp crust and just the right balance of everything, from cheese to toppings to tomato sauce. Great for a picnic in the park or gobbled up on the patio or informal indoor seating. 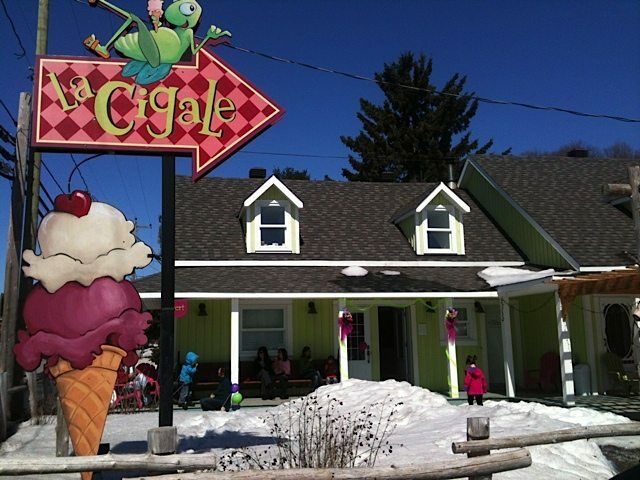 La Cigale, Chelsea’s beloved homemade ice cream shop, used to exist in this very spot but has since relocated up the road — a two-minute stroll away. How convenient! 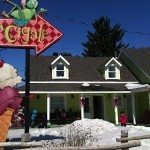 The new larger digs offer more lovely outdoor lounging opportunities around an equally eye-catching painted house situated across the street from the Visitor’s Centre for Gatineau Park. 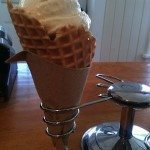 Choose the homemade waffle cone (defaulting to the regular or sugar cone is just wrong) and a scoop or two of their fresh, original flavours. I adore the tangy lemon ice cream (not sorbet) and Strawberry and Sour Cream, but there are many more—from Ginger Snap & Chai and Raspberry Champagne Sorbet to Coconut Cashew and Brownies and Cream. It’s the simple things done right that make a springtime jaunt to Chelsea feel like a mini-vacation. A slice of Luigi’s Secret — the secret is out! 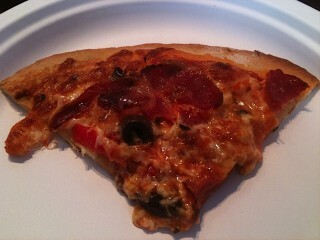 Cheezy Luigis Pizza, 241, ch. Old Chelsea, 819-827-2882. La Cigale, 4, ch. Scott Chelsea, 819-827-6060.